You gain 62 points [?] Loyalty program points By purchasing products included in the loyalty program, you gain points, which then can be exchanged to other products available in the store or for a permanent discount. Only available to registered customers. 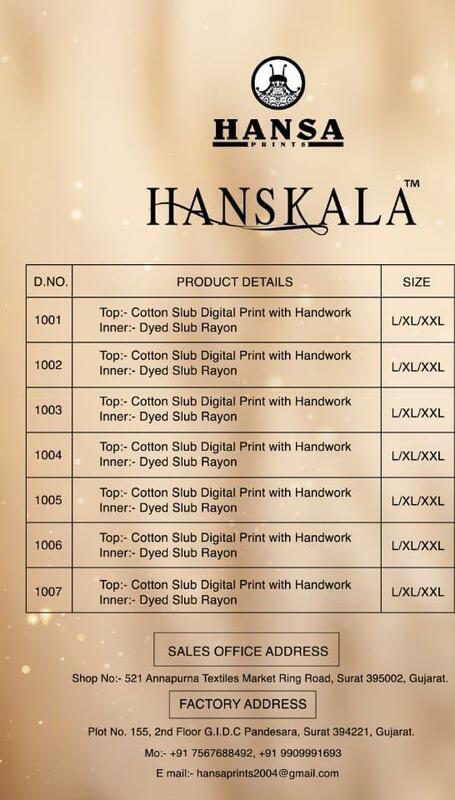 Presenting Latest Collection of Hansa Husna Lakhnavi Dress Material. Fabric Details : Top - Final Crape Digital Print With Embroidery, Bottom - Crape Dyed, Dupatta - Georgette Digital Print. Fabric Details : 14KG Rayon plan and print, Concept :- double layer silai pattern. Fabric Details : Top - Rayon Print 14KG With Dhoti Rayon 14 KG, Concept - Two Pictures With Dhoti. Fabric Details : Heavy Print Rayon. Fabric Details : 14 KG Rayon Print. Fabric Details : Top - Rayon slub, Bottom - Heavy Rayon free size stitch. Fabric Details : Top - CRAPE DIGITAL PRINT WITH EMBROIDERY (3.0 MTR), Bottom - CRAPE DYED (2.5 MTR), Dupatta - GEORGETTE DIGITAL PRINT (2.4 MTR).